Aydenne Simone made her mark with gusto on this year’s London Jazz Festival, and warmed up a bitterly cold winter night in Barnes, with her tribute to Sarah Vaughan. The singer has admired Vaughan ever since her father gave her the album You’re Mine, You at the age of six: “There’s something about the way she manipulates those chords which is just incredible.” Last night at the Bull’s Head she was ably abetted by her usual trio, consisting of Olly Chalk piano, Gwilym Jones drums and Tom Dring bass, with special guest Andy Davies providing reinforcements on trumpet and flugelhorn. The group stretches out on full instrumental numbers before Aydenne appears in each set and from the opening notes Andy Davies made his mark, playing trumpet with meticulous restraint which called to mind Lee Morgan. (Morgan is one of his trumpet heroes; on flugelhorn, he admires Tom Harrell.) The combo played a clipped, concise bop intro with a heavy element of swing. Davies’ trumpet and Olly Chalk’s slinky, punchy, propulsive piano adorned the solid rhythmic pulse of Tom Dring’s bass and Gwilym Jones’ drums. But as good as these musicians are, everything moves up a notch when their leader joins them and begins to sing. I Could Write A Book was irresistibly swinging with Jones shining as he set the pace. Davies interpolated snatches of melody on flugelhorn and Chalk was sparkling on his solo. Aydenne Simone sang with a superb sense of time, extracting all the inherent swing of the great lyrics. Cy Coleman’s Witchcraft was taken at a sultry strut, with Andy Davies playing sharp, incisive trumpet and Olly Chalk spilling notes like a high roller scattering chips at a casino. 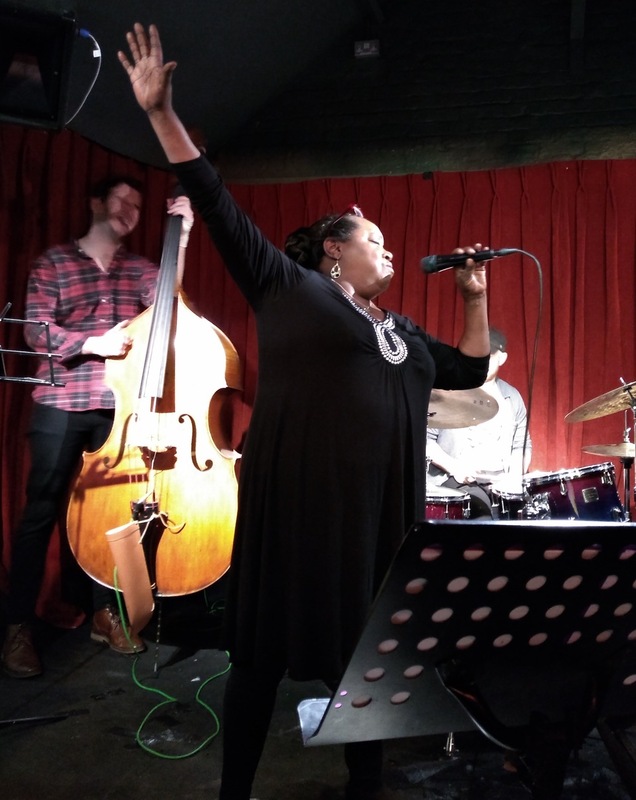 Tom Dring’s bass was throaty and articulate as Aydenne Simone interwove her rich, power vocal lines with Davies’ trumpet, playing cat and mouse with the timing and phrasing of the song. And she brought a charming Louis Armstrong rawness to her singing on this number. The Nearness Of You saw Olly Chalk in a new, meditative mode, choosing notes with shrewd solemnity. Gwilym Jones kept the rhythm ticking over using luxuriant brushes to provide a metronomic caress. Andy Davies played short, thoughtful phrases on flugelhorn. Tom Dring delivered dreamy, softly plucked measures of bass. Aydenne Simone’s singing was deep and resonant, conveying the lyrics with lightest of touches, only occasionally hinting at the vocal powerhouse she had in reserve. Aydenne Simone is generous with her musicians, giving them ample solo space and indeed, her own performance at this Sarah Vaughan gig was more like a soloist in a quintet than a singer with a backing band, and the songs were like blowing sessions. Her group is a tight, expert unit capable of delivering jazz on many levels. Last night they delighted a packed house with a gutsy performance of vocal classics which could scarcely have been improved.